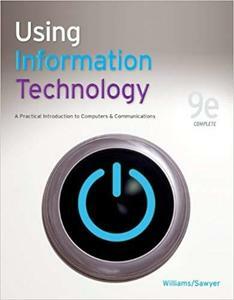 The Williams, Using Information Technology, 9th edition utilizes a practical, applied approach to technology. This text is user-focused and has been highly updated including topics, pictures and examples. The Williams text contains less theory and more application to engage students who might be more familiar with technology. Continually published and updated for over 15 years, Using Information Technology was the first text to foresee and define the impact of digital convergence, the fusion of computers and communications. It was also the first text to acknowledge the new priorities imposed by the Internet and World Wide Web and bring discussion of them from late in the course to the beginning. Today, it is directed toward the “Always On” generation that is at ease with digital technology, comfortable with iPhones, MySpace, Facebook, Twitter, Wikipedia, and the blogosphere, but not always savvy about its processes, possibilities, and liabilities. This 9th edition continues to address the two most significant challenges that instructors face in teaching this course: Trying to make the course interesting and challenging, and trying to teach to students with a variety of computer backgrounds. This text also correlates with SimNet Online, our online training and assessment program for the MS Office Suite and also computing concepts!